* The 4 volumes was later reissued by Kodansha in 3 aizōban editions retitled as Shadow Skil: Phantom Of Shade, Shadow Skil: Black Howling, and Shadow Skil: Black Wing respectively. * Shadow Skill: The Movie is the American compilation film of OVAs 2 to 4. Shadow Skill (影技 SHADOW SKILL, Shadō Sukiru) is a manga series with anime adaptations, produced by Studio Deen and aired on TV Tokyo in 1998 and has been released in the United States by ADV Films in 2005. The series is based on the manga by Megumu Okada. Shadow Skill is a shōnen series which features Styles of combat, such as martial arts. In addition to having a 26 episode television series three separate OVAs were made which have been released in the United States by Manga Entertainment. The television series, which has a different storyline to that of the OVAs, is distributed by ADV Films. In 2014 Okada announced that he has finished all of his work on Shadow Skill. Shadow Skill takes place in the warrior kingdom of Kurda, where the main character Elle Regu has recently become the 59th Sevaar, a title awarded to their most elite warriors. She often leaves a trail of destruction when she fights and along with a drinking habit. Elle is constantly followed by debts and throughout the series takes on jobs to work off these debts. One of these such jobs leads her to the Green Octopus Inn on an island outside the city, which eventually becomes the protagonists' base of operation. Throughout the series, Elle travels along with her adopted younger brother Gau Ban, who is studying Elle's fighting skills so that one day he could become the greatest Sevaar in Kurda. Also in Elle and Gau's life is Faurink Maya (Faury), a Sui Rame talisman sorceress, and Kyuo Lyu, a Septia beast-catcher and grandniece of Eva Stroll, the king of Kurda. Warriors in Kurda fight using the Kurda-style Kōsappō (交殺法, lit. "combining kill methods", ADV "Annihilation techniques") which has two general divisions: Hyōgi (表技, "open skills" or "bright skills"), which emphasize punches and throws, and Eigi (影技, "shadow skills"), which focus on kicks and the user's footwork. The Shadow Skill manga series was originally created by Megumu Okada as a self-published dōjinshi. In 1992, it was picked up by Takeshobo for serialization in its shōnen magazine Comic Gamma. The magazine ceased publication in 1996; a total of four tankōbon (bound volumes) collecting the manga's chapters were released during that time. Shadow Skill was carried over by publisher Fujimi Shobo in its magazine Monthly Dragon Jr. until 1998; another four volumes were released by that publisher. Kodansha then gained the rights to Shadow Skill and released the existing chapters in three large aizōban volumes from 1999 to 2000. The following year, Okada began regularly publishing new chapters in the publisher's seinen magazine Monthly Afternoon. Okada took a hiatus from the manga in 2006, but continued in 2009, submitting new chapters every other month, until finishing the series in 2014. In total, the Kodansha released the entire Shadow Skill manga in three aizōban and an additional 11 tankōbon. 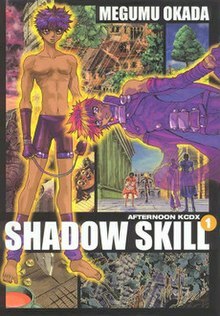 There have been a number of anime productions based on the Shadow Skill manga. It was first adapted into an original video animation (OVA) by Zero-G Room and released in Japan on October 25, 1995. Three additional OVA episodes were produced and released from September 21 to November 21, 1996. The first volume was officially numbered "volume 2.5" in Japan due to its chronological place among the four episodes. All four OVAs were licensed in North America and the United Kingdom by Manga Entertainment. The latter three episodes were compiled and released in English-speaking regions as Shadow Skill: The Movie, while the first OVA was later released as Shadow Skill: The Origin. Finally, a single cel shaded, CGI animation OVA titled Shadow Skill: Kuruda-ryu Kousatsu-hou no Himitsu (SHADOW SKILL ～クルダ流交殺法の秘密～, Shadow Skill: Secret of the Kurudan Style) was produced by Tandm and released in Japan on October 2, 2004. A 26-episode television series titled Shadow Skill - Eigi (影技～えいぎ) was produced by Studio Deen and aired on TV Tokyo from July 2 to December 24, 1998. ADV Films licensed the series in the United States. Anime News Network praised the series' Japanese and English voice acting, saying they did a good job capturing the light-hearted tone of the series. However, they felt the series stuck to the conventions of the martial arts genre with the plot focusing on fight scenes and the elaborate named moves being shouted aloud as they "powered up". As such, they thought that Shadow Skill appeals primarily to fans of the genre, but it was unlikely to appeal to viewers outside that fanbase. THEM Anime Reviews described the OVA series as "well executed" and "fun to watch". But they advised that Shadow Skill would mainly appeal to fans of the martial arts genre and that it lacked the story development and characterization needed to truly become a great anime. ^ a b c ANN staff (March 11, 2014). "Shadow Skill Manga Ends After 24 Years". Anime News Network. Retrieved March 11, 2014. ^ Oppliger, John (August 11, 2000). "Ask John: What Happened to Shadow Skill?". AnimeNation. Retrieved December 26, 2014. ^ Oppliger, John (October 19, 2011). "Manga Announces Shadow Skill DVD". AnimeNation. Retrieved December 26, 2014. ^ Oppliger, John (November 3, 2003). "New Shadow Skill OAV in Production". AnimeNation. Retrieved December 26, 2014. ^ ANN staff (June 27, 2005). "ADV to Release Shadow Skill TV?". Anime News Network. Retrieved December 25, 2014. ^ a b Martin, Theron (November 15, 2005). "Review: Shadow Skill - Eigi". Anime News Network. Retrieved February 21, 2010. ^ Jason, Bustard (2003–2004). "THEM Anime Reviews 4.0 - Shadow Skill". THEM Anime Reviews. Retrieved March 4, 2011. This page was last edited on 13 August 2018, at 13:33 (UTC).